Today, I awoke from a delightful experience with my dear Lord Murugan. In my dream, I saw myself wearing traditional Indian attire and was in what appeared to be some sacred place in India. As I was standing amongst a group of fellow Indian brothers and sisters, I noticed a small boy (Murugan?) around the age of 5 or 6 years. I happened to notice Him not because He was looking at me, rather I noticed Him because everyone in my group was gasping and gossiping at what He was wearing. The Child was wearing nothing but a loin cloth around His groin (Palani Murugan?) and was innocently smiling our way. I approached the Child, kneeled down before Him, and asked,"Where are your parents?" The boy did not speak but did, however, continue to smile back at me. Feeling somewhat responsible for His safety, I picked up the boy and lovingly carried Him in my arms as I walked back to the place where I was staying. As I was carrying Him in my left arm, I noted how incredibly light He was for His age. He was light as a sheet of paper. As I proceeded to walk back to my place, I comforted the Child saying,"Don't worry I'll take care of you (until I find your parents)." Upon entering my place, which appeared to be a small hotel, I took Him to my bathroom and turned on some warm water and gave Him a nice bath (abishekam?). He seemed to be enjoying me pouring water over Him for He had yet to utter a word to me! He stood completely still with His left hand placed on His left hip. His posture reminded me of the Palani Andavar Bala Murugan vigraham (statue) I have seen in temples. As I continued to pour the warm water over His head, my veshti began to get very very wet as the water was splashing from His body onto my attire. I noticed that as I was washing Him, the water became a bright yellow colour like sandlewood and a distinct undescribable pleasant fragrance began to fill the air. I couldn't understand how this yellow colour was coming from the Child's body because He was sparkling clean! I began to wonder about the aura of this Child and the prospect of Him being Divine (Murugan?). After I had finished giving Him a nice bath, I lovingly carried the boy out of the bathtub and gently placed Him on the ground and began to dry Him up. He then put His left hand on His left hip again while I was drying Him up. I happened to find a brand new veshti in one of my drawers and I used it to dress Him elegantly (alangaaram?). I then found some vibhuthi and smeared it on His forehead, upon doing this He smiled even more that I could see His glistening white teeth. I then led Him by hand to the altar in my room  at the centre of which was a beautiful portrait of Bhagavan Sri Skanda (identical to the form on the front cover of Hilda Charlton's book, Skanda; see picture on right). I told the Boy,"Come let us pray and I'm sure God Murugan will help you find your parents." O Lord, Thou art the basis of Siva and Sakthi (the Lingam and the Peetam), to Thee do I hail. O Lord, Whose form encompasses the immortal Vedas and Mantras, to Thee do I hail. O Lord, Thou art the embodiment of knowledge and wisdom, to Thee do I hail. O Divine Son of Sambhu (Siva), Who has millions of names, to Thee do I hail. O Divine Son of Uma (Parvathi), Who bestows happiness to all, to Thee do I hail. O Lord, Who rides the Peacock, to Thee do I hail. O Lord, Thou art the destroyer of all evil (asuras), to Thee do I hail. O Lord, Thou art adorned with the lilting anklets, to Thee do I hail. O Lord, Thou art the great and valourous warrior, Who is the King of all mountains, to Thee do I hail. O Lord, Thou art the sacred light that emanates from all lamps, to Thee do I hail. O Lord, Who plays in the pure cosmic sky, to Thee do I hail. O Lord, Thou art the Divine Consort of Devayaanai, to Thee do I hail - Please Bestow Thy Grace. justice, compassion and devotional service, dedicated to the Guru's feet - I will never forgot. Within that kingdom is Raajagembeeram, and Thou art its Lord! O Lord of Vayalur! In a dancing horse all the way to the heavenly abode (Maha Kailas). That Cheraman Peruman ruled Kongu Naadu, situated in Vaikavoor. Within Vaikavoor is ThiruvAvinankudi (PaLani's foothill), and Thou art the Life of that place. O Great One, the Commander-in-chief of the Devas! As I finished the Thiruppugal song and aarathi, I turned to offer the katpooram lamp to the boy who then waved His hand over it and then suddenly disappeared into thin air. 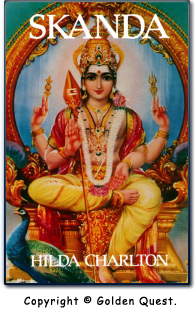 I then awoke with a peaceful contentment in my heart that Lord Murugan had given His grace last night.